When it comes to a company’s online presence, there’s a right way to do things and a wrong way to do things. This is especially so when it comes to digital marketing and your company’s digital presence as a whole. 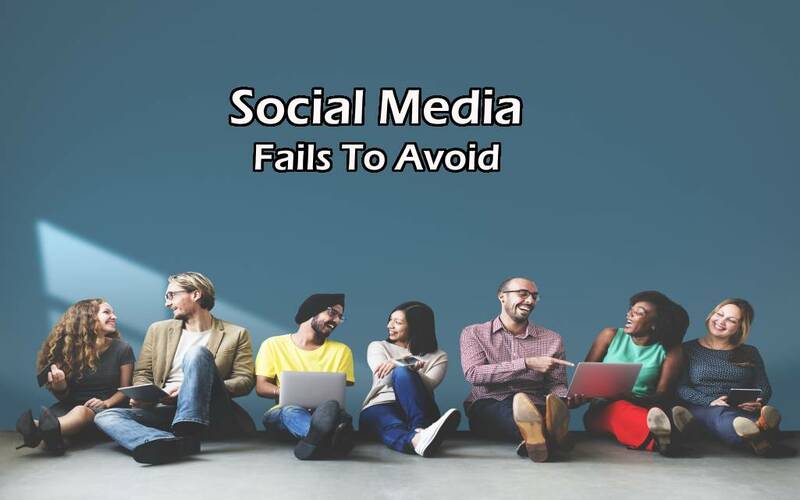 In order to help marketers figure out the do’s and don’ts of social media marketing, we’ve put together a list of top social media fails to avoid in 2019. This will help you step into into the new year fully armed with the knowledge of what not to do. This will, in turn, help you to determine what you should do on social media to grow your audience and social media engagement metrics. Here’s a simple fact. Every major social media platform out there has its specific rules of engagement when it comes to companies promoting their products & services. So for example, we know that there is a major difference in what you post on Facebook versus Twitter. We know that personally and we know that professionally. That said, some companies often figure that one post published across all platforms is all they have to do. This is, without a doubt, fail #1. To continue with our example, Facebook and Twitter often draw different viewers. Whereas Facebook relies on photos and hashtags and short posts, Twitter relies on micro-posts and media-rich content. Instagram is even more focused on visual media assets and hashtags. Then, there’s LinkedIn which caters to a different crowd of strict professionals all together. Knowing what your various audiences want when using various social media platforms is critical to putting together a professional online profile and making sure that you are reaching your various target audiences. So the simple rule of social media posting for companies is this: customize your posts based on the various platforms where you are trying to attract new customers. You must understand and appreciate each platform for what it can offer. For example, Twitter has short posts that can be easily retweeted. Instagram has a wide audience with easy scrolling. Facebook is a “like” away from hundreds and thousands of new viewers. LinkedIn is your introduction to the corporate and professional world with the “movers and shakers” admiring your content. So you should make sure that your content is working for your respective audiences and the platforms to match. Not sure where to start? Check out this social media fails whitepaper where 30 marketing executives from all over the US share their thoughts on how to use social media like a pro and grow your business. When posting online, the first rule of thumb is that you are doing it to get viewers. It makes sense to us, the business people, but what about on the other side of that screen? What about the potential customers who are reading your posts and what they’re looking for from a brand? Figuring out why you are posting – and why it should matter to your customer – is critical to staying in business and making sure that you are building a useful and refined online presence. Your customers have a problem or need and your business is going to be able to solve that. As such, your posts should focus on your customer’s issues and how your company can fix it effortlessly and in an affordable & practical way. Show the customer that their lives will improve by trusting you and your offerings. On that same note, make sure that you are showing your customers that your company is the best in comparison to your competitors. Prove to your customers that you are better than your competition for authentic reasons. One of the best things about having a digital presence is that you are constantly learning every time you are posting. This is because you get virtually instant feedback through statistics and analytics from your various online profiles and platforms. Social media analytics help companies track what is working regarding what content is engaging and what isn’t. But a lot of marketing professionals will simply see that some social media posts aren’t working but stop there with the analysis. They don’t try to learn from it or figure out what exactly wasn’t working with some specific posts. In some cases, marketers may ignore analytics altogether and continue posting or presenting themselves in an ineffective manner which weakens the online profile of a company and potentially drives customers away. Ignoring what the audience is telling you (or not telling you!) is a surefire way to damage your online presence. So make sure to have clear analytics strategies around your social media practice. You want to be able to make the best decisions and changes to your content strategy based on actual user data and consumer behavior. We expect our doctors and lawyers to be carefully trained and hire them accordingly. But unfortunately, social media management, as a profession, does not get the same scrutiny. To save money or stress, many marketing departments will often randomly select someone within the company to work on social media and simply leave them to it. That’s because social media management is often seen as an inconvenience aka something companies have to do instead of something they should do because it’s beneficial to the core business. When it comes to social media marketing, as with other roles in the company, hiring an experienced professional in the relevant field is the best way to go. After all, like most things, doing social media right from the start is easier than having to go back and undo work at a later date. Specialized professionals offer guaranteed results that your company can use to pull ahead of the competition the right way. There’s nothing worse than a pushy street seller or a telemarketer to ruin your day. And the same goes for viewers and social media content. When a company focuses on selling their product (thinly veiled or overtly) on online platforms, it will drive customers away. If a customer is on Facebook and seeing post after post of you trying to sell your company, that act makes people roll their eyes and ignore your post or worse yet, unfollow you. Not only that, but social media platforms themselves will recognize what you’re doing and even bury your posts so that no one is seeing them. To help make sure that your company is getting the right results online that result in sales, the trick is to focus on a gentle push towards the product, but focus on why it matters instead. Tell customers your story, and they’ll be able to see why they should be motivated to purchase your product or, at least, share it with someone that they think might be interested. Viewers don’t want to be pushed or bullied into buying your product. Therefore, make sure that you keep your sales content minimal and relatable. Your viewer will appreciate it. 2019 is right around the corner, so use these social media fails – and how to correct them – to help you propel your company’s social media profile into the future.